Medieval fashion, 21st Century comfort! We're bringing them back! THE COIF. In this climate of cold cruel hardship, one thing that can warm your day is having a warm head, which also helps keep your feet warm. 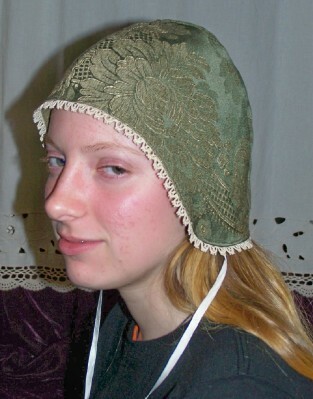 This small hat was worn for centuries in the cold and drafty castles and hovels throughout the world, as padding for your helmet or as an anchor for your hat. 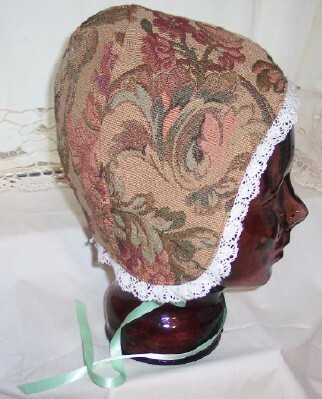 Coifs are great in the house, for your outdoor chores, or for wear as a night cap. We have some on hand for instant delivery, and we are happy to accommodate your custom requests. Volume orders are accepted. Here are some examples of coifs we have made. Each one you order will be a custom design and unique. 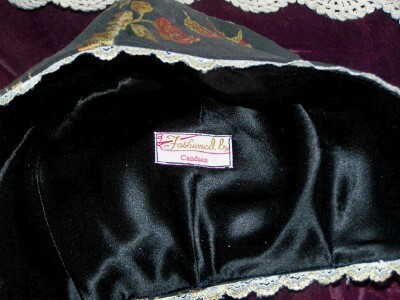 You choose the fabric and trim from choices provided through email, and your coif will be as close to your taste as we can possibly make it. Please state if your Coif needs to be a larger size. Each Coif is Completely lined for elegance and warmth in winter. 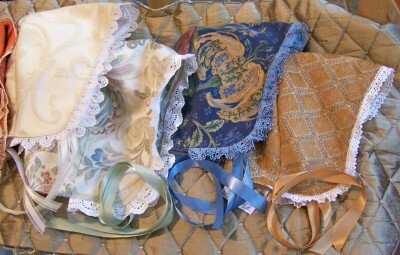 1/2 inch wide ribbon ties, With Lace or without lace, same price. 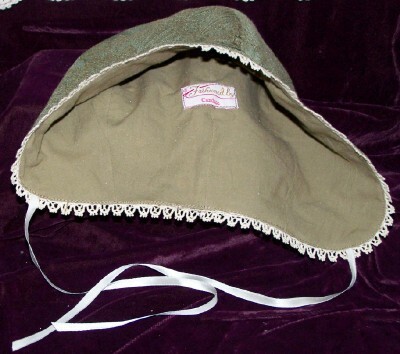 This is an example of the Simple Ladies' Coif. Yours will be in a fabric you choose from samples we send by email or through the UPPS, if you would like to see them in person. 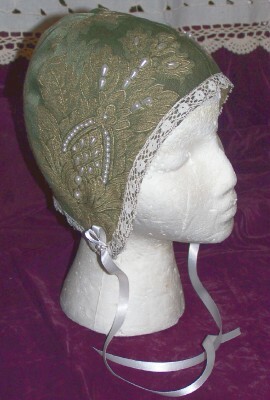 Each Coif is unique, brocade and lace selected for each design from Mom's collection of antique laces or modern styles. 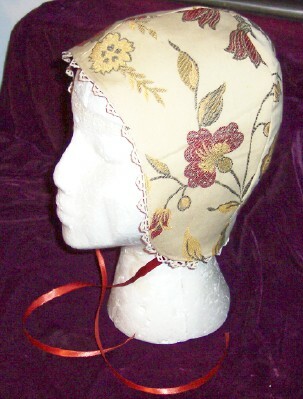 Each Coif made by hand by Candace. Each Cap Fully Lined in a complimentary color. Candace's Label on each Coif. Design your own coif for your specific outfit. Simple Coif without beads. or ask for a sample swatch images. 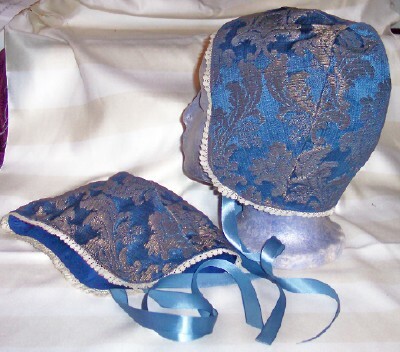 Design your own beaded coif for your specific outfit. 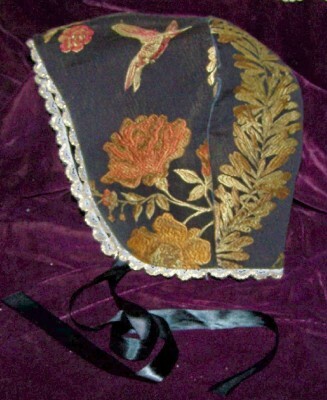 Simple Coif with beaded pattern in the brocade. 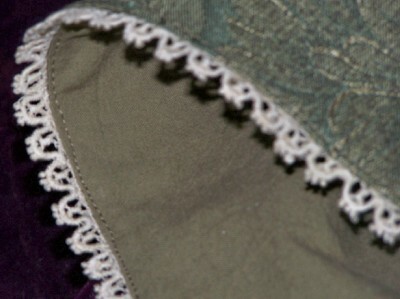 or request for a sample swatch images of available lace and fabric..